As your dog ages, he’ll adapt and change because of his own life experience. However, as time takes its toll, he’ll process this information less efficiently. In this chapter, we lead you through your dog’s aging process, helping you gain insight into age-related changes in your dog’s mind and behavior. Simple awareness can instill empathy leading you to modify your environment and communicate in a manner befitting the dignity of an older dog. The rate at which a dog ages depends a lot upon his size. Large dogs age more slowly when they’re young and take longer to lose their impish ways and achieve sexual and social maturity. However, by the time they’re around 3 years old, they’ve caught up with smaller breeds, and from then on, they age significantly faster. It’s this pattern of aging that ultimately results in smaller dogs having a much longer life span than larger dogs. At the behavioral level, this faster aging process also means that large dogs will start to act like senior citizens much earlier. Table 9-1 combines results from a number of different studies to allow you to convert your dog’s actual age to its human equivalent in years. 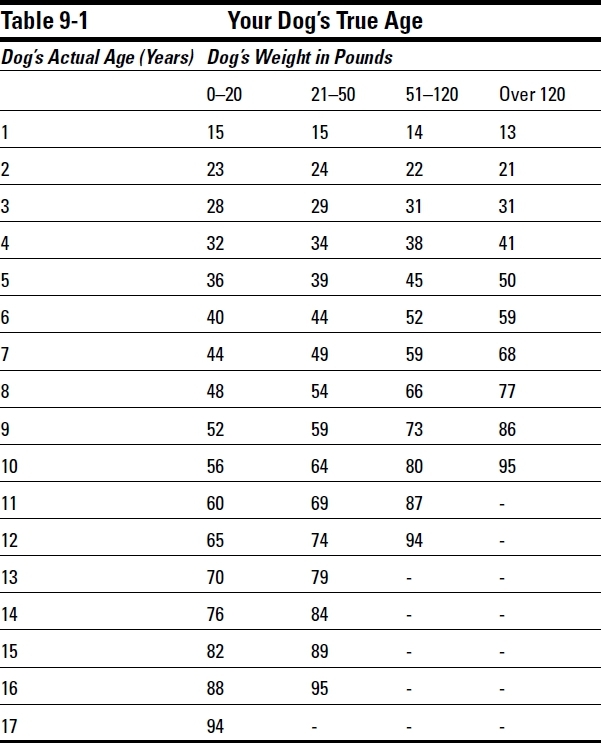 To find your dog’s equivalent age in human years, simply find its actual age and then check under the column corresponding to its weight in pounds. The old-fashioned folksy way of estimating a dog’s age, suggesting that every 1 year of a dog’s life is equivalent to 7 years of a human life, was really just a rough guess based on the fact that the average life span of a dog was estimated at that time to be around 10 years and the average life span of a human was around 70 years. Other factors seem to affect aging, too. The shape of a dog’s face is one such example: Dogs with sharp, pointed faces that look like wolves generally have longer lives and seem to age more slowly. Dogs with very flat faces, such as bulldogs and pugs, often have shorter lives and age more quickly. Of course, a dog who is well cared for can often live much longer than average for its size, shape, and breed. Not only can your dog’s age predict her life span, it can do the same for her behavior as well. The numbers in Table 9-1 give you an estimate of the mental age of a dog in human years, allowing you to judge how a dog may behave in certain situations or under particular stress. Human thought processes slow down sharply at around 55 years of age. The giant breeds, such as the Saint Bernard, start showing the kinds of thought patterns, problem-solving changes, and learning problems that we associate with humans who are that age when the dog is somewhere between 5 and 7 years of age. Other big dogs (not quite as large as the giant breeds), such as the Alaskan Malamute, start thinking like seniors between 6 and 8 years of age. The medium breeds, such as the Cocker Spaniel, won’t start acting like seniors until 7 to 9 years of age, while the smaller breeds, such as a Yorkshire Terrier, won’t act like seniors until they’re 9 to 11 years of age. Of course, there can be a wide variety in the abilities and behaviors of dogs the same age, even within a single breed. Certain individual dogs seem to age more rapidly, while others go many years past when we may expect. Like people who remain active and engaged, dogs who use their brain and mind seem more vital as they progress into their golden years. Dogs and humans age similarly both psychologically and physically, though with dogs, the process is accelerated. As the body matures, it stiffens and grows progressively weaker. Aging dogs move less quickly and are less agile as the process of growing older limits their flexibility and coordination. No less loving, an older dog grows more dependent on the care and affection of his family to stay connected to life. When Stan’s old dog Wizard lost his ability to jump up onto the bed where he had slept next to his master all of his life, Stan simply built a set of carpeted stairs that he placed next to the bottom of the bed. This adjustment allowed Wizard to hobble up and rest next to his companion’s feet as he’d always done. Older dogs are more prone to diseases and other conditions related to their overall decline. Because any discomfort will result in changes in behavior, it becomes increasingly critical for older dogs’ guardians to nurture their existence. Detecting distress in an older dog isn’t always easy, as he doesn’t show the same symptoms that humans do. As a species, dogs generally have a higher tolerance for discomfort than people do, leading many people to falsely assume that their dog is fine when he’s not. Although people are quick to communicate the slightest distress, encouraging social support and medical help, dogs are more likely to adopt behaviors that hide their pain from plain view. In essence, your dog hides his pain to appear to be more in control of the situation, thus making it difficult for you to recognize when your dog is hurting. Excessive panting and rapid breathing occur, even when the dog is at rest and not heat-stressed. The dog may shiver or tremble. Sometimes, the dog may appear to be extremely restless and change positions frequently while lying down or sitting. At the other extreme, he may appear extremely reluctant to change body positions. The dog may pull away when being touched, may appear to be guarding one part of his body, and may even show uncharacteristic aggression, growling or threatening when touched or even approached. Licking or chewing at painful areas is also common. You may see body cues, such as twitching, limping, or a frozen appearance. Dogs in pain often lose their appetite. More subtle signs include rapid heart rate, dilated pupils, and a rise in body temperature. If your dog is showing any of these signs, see your veterinarian immediately. The effects of age are much the same on dogs and humans: joints wear out, systems break down from overuse, and faculties lose their functionality over time. Though the affects of time are universal, diminished sight and hearing can have a major effect on the humananimal bond. Fortunately, you can easily modify your environment and communication style to prevent this possible source of stress and ensure that he lives out his golden years happily. One simple method is to always train your dog using both hand signals and voice commands at the same time. That way if age weakens his hearing he can still respond to your signals, and if his sight dims he can still respond to your voice. Hearing loss is commonly a result of physical wear and tear. In the inner ear (the cochlea), tiny hairlike cells bend to register the arrival of sounds. Unfortunately, this repeated bending and flexing over the years of a dog’s life can cause a weakness in the material and the hair can break, just like a wire coat hanger that has been bent in the same place many times. Once these hairs are damaged, they don’t grow back, so for each hair cell that is damaged, the dog loses a bit of his hearing ability. Of course, age isn’t the only reason why the hair cells that register sounds break. Hair cell damage is often the result of exposure to loud sounds and is more common in dogs who have been exposed to gunshot noises in hunting or who have lived in cities and been exposed to high levels of urban noise. In addition, chemicals can play a role, particularly exposure to various common solvents (cleaning fluids, paint thinners, and plastic solvents), which can accelerate damage to the cells in the ear. A lifetime of minor stresses explains why most dogs in the 12- to 15-year-old range show some evidence of hearing loss. Your dog seems to ignore your calls, especially when out of sight or distracted. Your dog sleeps more soundly than he used to, instead of bolting awake at a loud noise. Your dog awakens with a growl or a snap if touched while sleeping. Outdoors, your dog may appear to be oblivious to the sound of approaching cars. Personality changes may occur, such as the dog appearing to be more fearful, dependent, lethargic, edgy, or snappish. Most dogs rely on hearing to locate family members, so a hearing loss often leads to a sense of isolation, which can give a formerly confident dog bouts of separation anxiety and perhaps even bring on episodes of panic. For an easy solution, wear perfumed body lotion, scented perfume, or aftershave. Because your dog’s sense of smell is his most robust sensory system and suffers least from the aging process, the scent you wear makes you a lot easier to track down. Furthermore, because scents tend to persist in the air and cling to surfaces, your dog will recognize that you’ve been nearby recently, and feeling your presence in the vicinity will comfort him even if he can’t hear you. To wake a deaf dog without startling him, use your dog’s sense of smell to avoid startling him from a sleep. When you approach your sleeping dog, hold your hand near his nose for a few seconds. Your scent will penetrate his sleeping brain, and he’ll awaken when he recognizes your scent. Reach out to pet him only after he has roused naturally. Thump on the floor with your foot or slap a wall or some solid furniture, which causes vibrations that the dog can sense. Wave your arms vigorously, because dogs’ eyes are sensitive to movement. Wear a small flashlight or a laser pointer on a lanyard around your neck. A bright moving light quickly causes the dog to turn to you. If your dog is outside (enclosed) at night and you want to call him in, turning your porch light off and on serves as a good signal. Obviously, if you’re close to your dog, you can always touch him. However, it’s important to always touch him in the same place so that he recognizes that it is a signal and not a potential threat. The shoulder or top of the head are ideal. Always leash a hearing-impaired dog when walking him in an unenclosed area, such as the park. In these areas, a long or retractable leash is ideal because it still allows the dog to run and play but gives his owner control over him. Buy a dog tag that states, “Help me home. I’m deaf,” and includes an updated phone number, should he mistakenly get loose. In some cases, what appears to be age-related hearing loss may actually be due to other factors that can be remedied. The dog’s ear canal is much longer than that of humans, and it takes a right angle turn as it reaches the eardrum. This shape, unfortunately, is ideal for collection of debris. Wax, dirt, and hair build up in the canal and create a plug that keeps the sound from reaching the eardrum. This same debris can also attract ear mites, which in turn can cause ear infections (called otitis). All these factors can result in swelling and fluid accumulation that can effectively block much of the sound from reaching the middle ear. Dogs that spend a lot of time in the water (especially pond or lake water that may not be clean) are most susceptible to these problems. Furthermore, those long floppy ears that look so appealing on dogs like hounds and spaniels also tend to trap moisture and limit air circulation, which can turn the ear into a good breeding ground for infections. The dog frequently shakes its head or scratches its ears. Touching the dog’s ears causes him to pull away or whimper. You can smell a putrid ear odor when you sniff. The dog walks with her head uncomfortably cocked to the side. Lift the flap of the dog’s ear or check closely on a dog with pricked ears. You’re looking for normal ears that are pink with a small amount of amber wax. (The wax actually helps to protect the ear canal.) Warning signs include any discharge, blood blisters, excess reddening, or crumbly material. These symptoms should prompt a call to your dog’s veterinarian. It is often the case that a good ear cleaning and perhaps a course of antibiotics may well clear up hearing difficulties. A common problem with deaf dogs is excessive barking. While they obviously can’t hear their own barks well, they still recognize the sensation barking creates and a human’s reaction to their behavior. If their barking is effective in attracting attention, they’ll continue to bark, and often bark louder in an attempt to hear themselves as they once could. Though the root cause of hearing-loss barking is often a feeling of confusion or social isolation, a human comforting the deaf dog that is barking noisily actually makes him more anxious about his predicament. A much more effective strategy is to put the dog in a small room or his kennel until the barking stops. Wait for a pause in the barking of 30 seconds or more and then let him out and reward his now quiet behavior. Put a bell on your dog. Though the bell is useless to a deaf dog, it allows you to hear your dog when he’s on the move. This sound allows you to find him more easily because he clearly can’t hear you when you call. Chemical changes: As a dog ages, changes occur in the proteins that make up the lens of his eye. These chemical modifications create inflexibility that limits the eyes’ focusing ability. Even under the best of conditions, a dog’s vision for near details is poor, but when the composition of the lens protein shifts, he becomes even more farsighted. Though some focusing ability may remain, it may take more time for the dog to recognize objects and people. Aperture dysfunction: Another visual impairment occurs when the pupil of the eye (through which light passes) loses its ability to open and close efficiently. The inability to adjust the size of the pupil in relation to given light conditions degrades the quality of the visual image. Nuclear sclerosis: For most owners, the most visible change in the dog’s eye is a haziness that appears on the lens of an older dog’s eyes, called nuclear sclerosis. On the bright side, this condition doesn’t affect sight much, unless this cloudiness becomes dense (when it appears to be almost white). An inexperienced viewer may mistake this cloudiness for the condition known as cataracts. Cataracts are the single leading cause of blindness in older dogs; please seek a professional’s opinion if you suspect your dog is suffering. You do have medical options. Cataracts: A cataract in a dog’s eye results when cells within the lens of his eye become dark and opaque over time. Cataracts are often the result of events occurring in the dog’s life. They can be the result of diabetes, nutritional deficiencies, exposure to certain toxins, or injuries to the eye. In addition, simple exposure to the ultraviolet light in bright sunshine can trigger cataracts. Hereditary factors are also involved, and several dog breeds, such as Cocker Spaniels, Poodles, and Lhasa Apsos, have a predisposition toward cataracts. Veterinary science has recently developed effective surgical treatments and can implant a prosthetic device similar to the one used to restore human vision. These treatments are effective, though costly. Glaucoma: The second major condition that causes blindness in dogs is glaucoma. It is caused by an increase in fluid pressure, which then damages the neural tissues in the eye that are responsible for registering light. Normally, fluid is drained away at the same rate it enters the eye, but in glaucoma, the outlet for the fluid is narrowed or closed. Aging dogs with high blood pressure are most susceptible to this condition. If the glaucoma is detected early, drugs and surgery can often hold off any loss of vision for quite a while, although the longterm success is disappointingly low. In glaucoma, as in cataracts, heredity is also a factor. Some dog breeds, including Cocker Spaniels, Siberian Huskies, Basset Hounds, and Beagles, appear to be especially susceptible to these problems. If you notice any changes in your dog’s behavior or visual awareness, please make an appointment to see his veterinarian. Many treatable conditions affect vision. Blind dogs can live comfortably. Some take quite a while to even recognize the full limitations of their handicap, since sight usually diminishes progressively and isn’t a dog’s primary sense. Attach short directional word or phrases to daily routines. Verbal cues reassure your dog and help him feel connected to your daily interactions. Your voice will both guide and reassure him (see Communicating with Your Dog and Happy Training, Happy Tails). Create landmarks for your dog, keeping daily objects, such as dog bowls and bedding, in the same place. In addition, avoid relocating furniture, TVs, or radios to prevent any disorientation that may result when the dog’s mental map is disrupted. Use carpet runners to create a “road” to familiar rooms. Use different scents to map out locations or forbidden areas. For example, you can use scented oils or powders to cue your dog to avoid ledges or locate important places in a room. When you travel, these same scents can comfort and guide him in an otherwise unknown environment. If your dog is distressed at not being able to find you, wear a familiar scent or clip a small bell to your wrist or belt loop. Return objects to where they belong. Things that are left out are opportunities for collisions that may disorient your dog and lead to anxiety or fearfulness. If your dog is an outdoor pet, don’t plan major landscape projects. If your dog is disoriented, lead him to a favorite anchoring spot, such as a familiar bed, and pet him calmly until he’s settled down. Going up and down stairs is difficult for blind dogs. Install carpeting and chaperone your dog until he feels confident: Hold his midsection gently as you support his weight and/or lead him up each step by luring him with a favorite treat (see Happy Training, Happy Tails). The most important tool in dealing with a blind dog is the leash. Think of the leash as giving you the ability to hold your dog’s hand. Your dog will feel more secure because he knows where you are. Leashing the dog can be helpful even in the house until he gets adjusted. The dog should certainly be walked on the leash because his owner is now his eyes. Feeling socially isolated is a problem with blind dogs just as it is with deaf dogs. Most dogs seem reassured if they know where their owners are. A dog that has been free to roam the house may have to be confined at night. Securing your dog next to your bed at night or using a crate is an ideal solution. Once the dog gets used to the routine and has a mental map of his world, he’ll do fine. Many dogs happily go around their homes and live a happy life despite their blindness. In fact, many do it so well that visitors don’t even notice that the dog is blind. Your dog’s personality and behavior will change as she grows older, and although some dogs may lose the zest for life, it’s not a necessary or even normal part of dogs growing older. In today’s society, where dogs are nurtured as never before, they’re, living longer. Better nutrition and medical services ensure that dogs are often making it well into their senior years, and because of that we’re seeing more of the degenerative conditions equated with aging, including arthritis, heart disease, cancer, diabetes, and even dementia. A medical condition known as Canine Cognitive Dysfunction (CCD) causes the same kind of disorientation, physiological brain alteration, confusion, memory loss, and personality changes that humans face with Alzheimer’s disease. CCD is sometimes referred to as old dog syndrome, brain aging, doggie dementia, or senility. Seldom does a dog show all these symptoms, but any dog that shows two or more of them may well be developing CCD. Several behavioral interventions can keep mental decline at bay even as your dog ages. Pattern training and repetition is reassuring to an older dog. Once a dog has established a regular routine, he’ll hold to that pattern through his older years. Familiar directions encourage your dog’s participation in daily activities and give him security and comfort. Old dogs can still learn, and they love the attention and the opportunity to please you and earn rewards. Though it may take more time and patience, recent research shows that older dogs are eager to learn new routines. Older dogs have a hard time unlearning learned behavior patterns, such as jumping on guests or not barking at strange noises. Those lessons are better addressed while the mind is still impressionable. Perhaps the most exciting work about the aging mind is the finding that our day-to-day experiences affect the very structure of our brains and may allow us to counteract the effects of age on our brains. Researchers at the University of Toronto studied a group of aging Beagles in order to see how changing the day-to-day experiences of older dogs would affect their minds. Provided with a cognitive enrichment program, the dogs were challenged with learning tasks and puzzles, such as finding hidden food rewards, five to six days a week. This stimulation went on for a year, at which point each dog was tested for mental awareness and new skill learning capacities. The dogs in this group universally showed better performance in learning and problem solving tasks than did their littermates who had not had these additional experiences. Provide mental stimulation in as many ways as you can. Go for short walks, especially in new places. Pet your dog and socially interact with her. Try to teach your dog something new each week. If you’re willing to put up with a bit of controlled destruction, create problems to solve by putting kibbles or treats inside an old towel, rag, or crumpled plastic jug and allow the dog to tear the item apart to get to the food inside. The cardboard rolls that toilet paper and paper towels come on are great for this activity. Put some kibble in them, crumple the ends, and let the old dog tear apart the “toy” to get to the food. Turning your dog’s meals into searches can also be useful. Divide the dog’s meal into small portions, each in a plastic container, and hide them around the house to keep your dog actively searching for a while. If you can put up with the potential mess, simply toss some nonmessy bits of food around a room or yard and encourage the dog to find them.